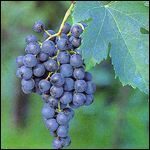 Black grape variety that is extensively planted throughout the world; it is important for making both varietal wines and blends. Merlot is the most cultivated grape in Bordeaux, where it is used in the wines of the right banks Saint-Emilion and Pomerol where it dominates the fabled Petrus wine.It is grown throughout France and blended with Malbec for the wines of Cahors. In Tuscany it is often blended with Sangiovese. In Hungary it is a component of Bulls Blood wine. In the USA it's used for 'Meritage', the countries answer to a Bordeaux blend. In South Africa it's grown in the wine regions of Paarl and Stellenbosch. Merlot is also extensively grown in New Zealand, Australia, Argentina, and Chile, where wine labelled as Merlot turned out be Carmenere! Merlot is known for its soft velvety texture and plum, berry and currant flavours. However, as it ages in oak, it can develop vanilla and chocolate notes. In cooler climates Merlot tends to taste more of red berries and plums, and can take on a green vegetal note, whereas in warmer climates the emphasis is more black fruits - plum, blackberry and black cherry. Where it has seen a lot of sun it can even have fruitcake notes.